What a difference a day makes. 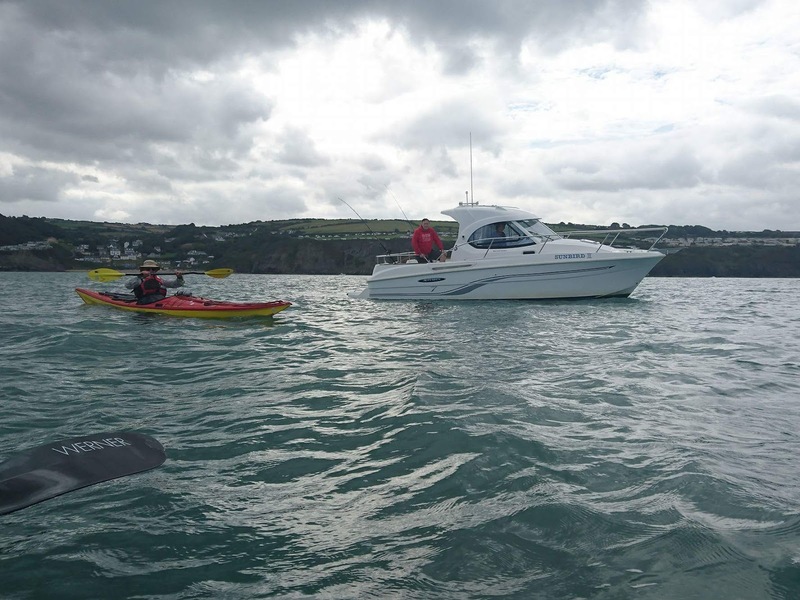 After a choppy but manageable crossing from Aberaeron to New Quay with Andy Campbell and his paddle board, we expected more of the same for the next stage onto Fishguard. 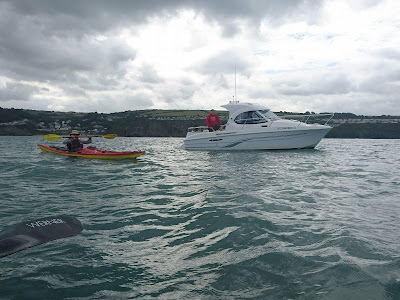 Joined again by Tim Richards of New Quay Yacht Club, who had paddled out to meet us the previous day, this time with NQYC yacht following, we got the first hour or so of trouble-free kayaking we were expecting. 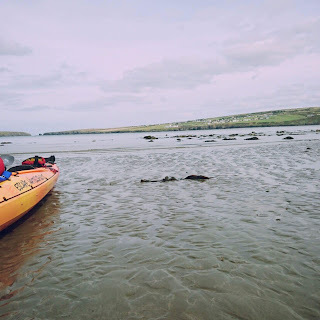 Knowing we had a couple of knots of flow with us, we were quite happy to press onto Newport Sands. That was until we got to Cardigan Island when any protection from the headland was gone and we had the full force of a 20mph southerly. 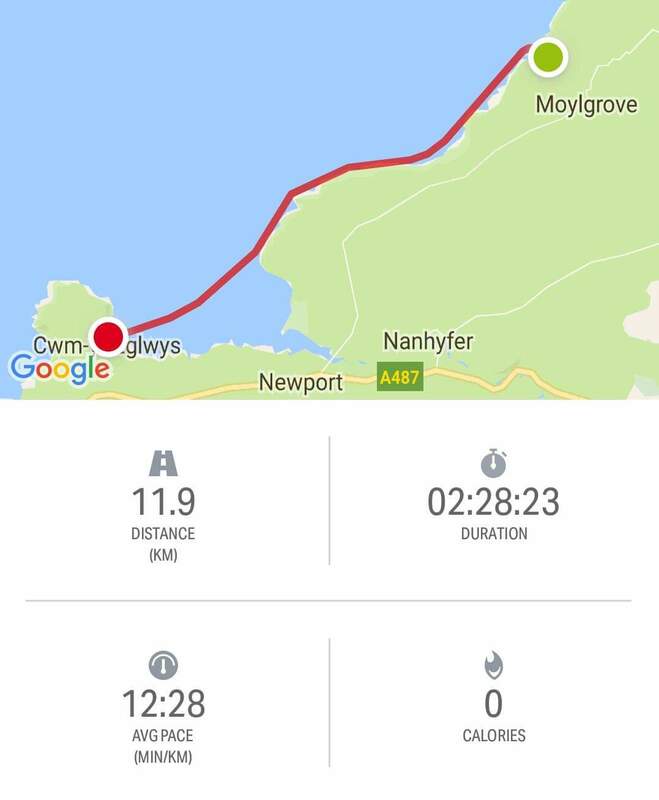 The wind had come earlier than expected and we were in for a slog to Poppit Sands for a rest and to contemplate the next stretch to Ceibwr - the only get out before Newport. Having made the call to push on, we knew we would be up against it. Little did we know how tough it would be. 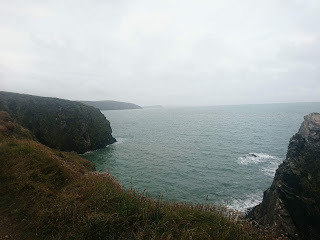 As we approached Cardigan Island, out of the lee of the headland past Mwnt - where we spent ten or so minutes readying ourselves and chasing a wayward pasty packet around the bay, we felt the full force of the wind against us. Paddling against wind was tough, there were points where we thought of turning back, but its not a decision we take with even one or two knots progress - it's still progress. We were getting battered and so was Gary, our trusty mascot on the bow. Wave after wave crashed over us, reflecting off the sheer cliffs to hit us broadside, as well as head-on and from the stern. This was energy-sapping stuff. And then we realised, perhaps this next bay wasn't Ceibwr after all. Maybe we couldn't land. Perhaps we might have to turn back. But with the wind due to pick up even more in the next half and hour we had to land! What felt like seconds after this ultimatum had dawned on us, the tranquility of Ceibwr came into view. We'd done it! Just. Both of us were equally relieved but couldn't help feeling a little disappointed about not reaching Newport - even if this was supposed to be our rest day. 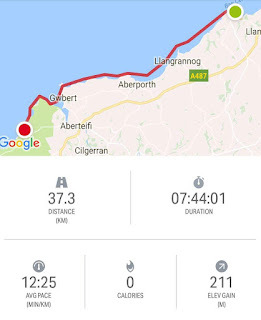 After a refuel and recharge overnight at the Clark house in Llanpwmsaint, we headed back to Ceibwr for a two-hour push to Newport. We had a very small window to get the job done. The weather was due to pick up and fast, and with no support boat, it was down to us. 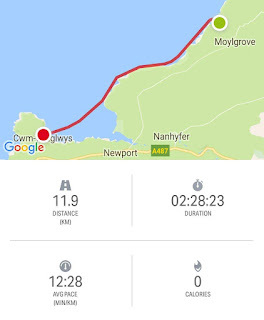 After six consecutive days of paddling we were both really starting to feel the strain, but we knew the 10km to Newport was a must to keep on track. 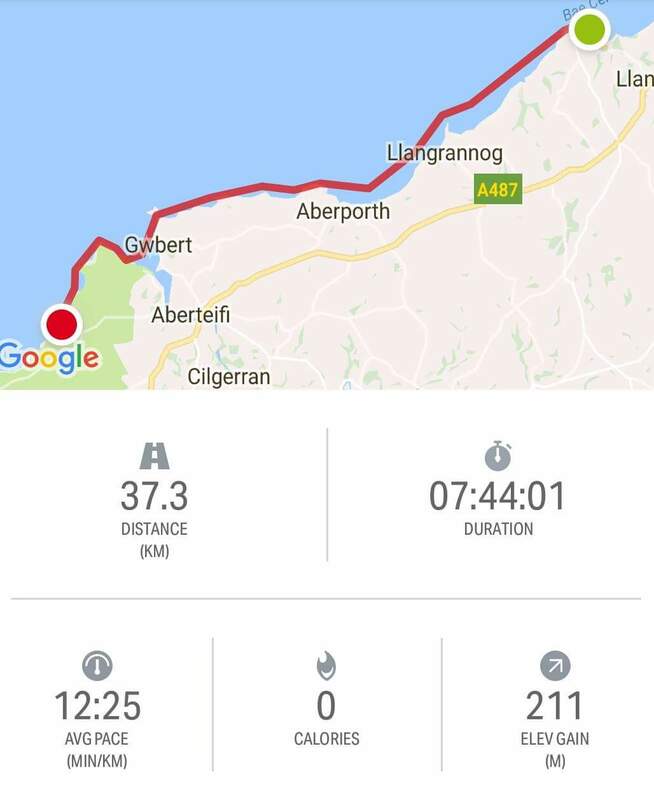 Again with strong winds against us, due to pick up to a 26mph squall at noon, we set off just after 10am, having logged a passage plan with Milford Haven coastguard. This element of the trip seemed now somehow more than just a tick on the checklist. 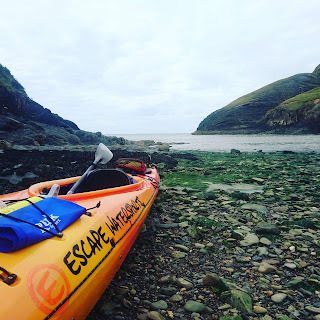 We rounded the next headland in very good time considering the conditions, so much so we decided to push onto the other side of the bay for Cwm Yr Eglwys to make an extra bit of distance before Sunday's enforced rest day and the possibility of missing one, maybe two more days of paddling time due to 40mph gusts. 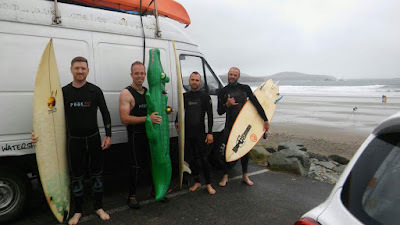 From there we headed to the night stop in Goodwick where we were joined by our top chum Nick Green and his surfboard. We duly celebrated this by going to the pub. Knowing the day was a kayaking write-off we headed for the beach in search of some surf with three boards and an inflatable crocodile. The red flag warnings just added to the fun. Next we're hoping for a window for to head south for Marloes, but with the wind picking up again, it may be a day or two before we can get on the water. But one thing is for sure, if we can, we bloody well will!